This campaign is set ten years after a previous set of adventures (HERE). This is the fourth full session of the current campaign (Session III can be found HERE). There was also a brief interim session (HERE). The party regrouped in Water Village (Naam) discussing the next course of action they should take. They decided to go to the Celestial Spirit Temple and use its library to learn about immortals, hoping they could place the Phoenix Crown of Bao in the protection of more powerful beings. When they arrived, for a small fee they were granted access to the library of the temple and learned from their readings that a group of five immortals were believed to inhabit Red Mountain Villa, on nearby Red Mountain. Because Kang Xi and Long Shu had seen Golden Dragon Sect members heading toward the Inn of the Emerald Monk, they took Rong with them to investigate (it being only two hours away from the temple) while the rest of the party took the path to Red Mountain. At the Inn they found a large number of Golden Dragon Sect members, led by Bronze Master. They also sensed that people in the tavern were angry with them. A woman named White Fox slammed her hand on the table they seated themselves at and accused their sect of murdering Lady Tao. White Fox informed them that four days ago, Lady Plum Blossom had been seen walking into Lady Tao's chamber. There was a loud argument, then Lady Plum Blossom crashed out the widow and fled. 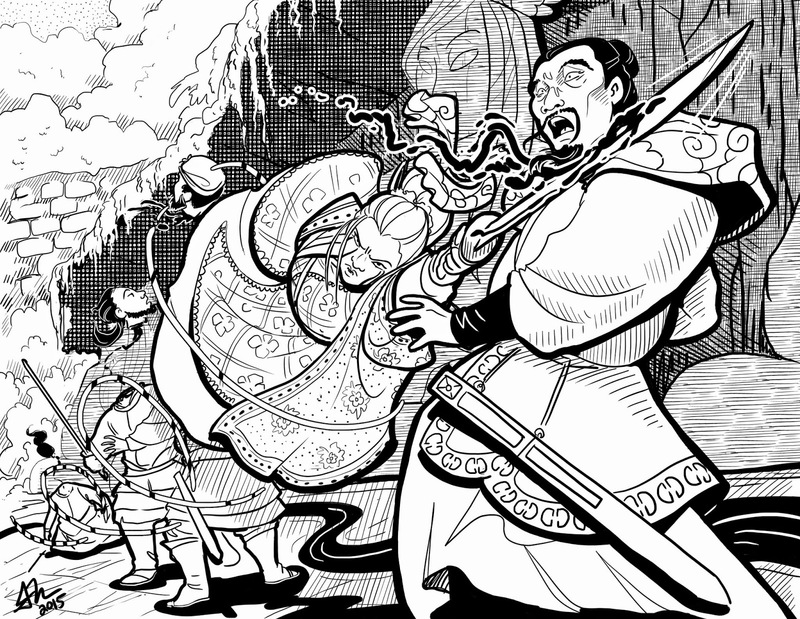 When martial heroes in the tavern went to investigate, they found Lady Tao had been strangled. Long Shu told those present that he didn't believe Lady Plum Blossom was guilty and that there must be another explanation. Bronze Master informed them that the other sects had asked him to lead an inquiry before anyone sought justice. In the interest of fairness he would leave the matter in the hands of Long Shu and Kang Xi. If they found evidence of their master's guilt, then all would believe she was truly guilty, but if they didn't find any such evidence no one would seek justice against Lady Plum Blossom. He made a point of proclaiming this before everyone in the tavern so they could see the fairness of the resolution. Long Shu and Kang Xi interviewed a number of witnesses. It seems she had been looking for the Merciless Sunflower Manual and that the argument she had with Lady Tao was about its location. When they spoke with Lady Tao's husband he told them it didn't make sense and he didn't believe Lady Plum Blossom had killed his wife. His wife had been planning to reveal the location of the Merciless Sunflower Manual to her anyways, and the two always got along. He suspected another sect was using some sort of trickery in order to get the manual for themselves. So he decided to tell Long Shu where his wife believed it was located (she believed the Master of Je Valley possessed it). On their way from the inn to meet back up with the party, Long Shu and Kang Xi saw Headmaster Mu arrive (Long Shu had sent a message asking him to meet them at the Inn). They lied about what they learned and told Headmaster Mu to wait for them at the inn for a few days. As the rest of the party travelled through the Dai Bien forest they were ambushed by Dancing Hawk, River Master Li and a group of Mystic Swordsman. This time Dancing Hawk was missing an eye and a hand, but was still out for revenge over the death of Madame Hamaya. The attackers were perched atop two outcroppings of rock overlooking the pass but they party saw them before they could act. This was a long battle with the players holding the upper-hand throughout. Still they took some heavy shots before Kang Xi, Rong and Long Shu caught up and lent a hand. By the end of the fight they had killed Dancing Hawk, knocked out the Mystic Swords and had River Master Li at their mercy. When they opted not to kill him, River Master Li was thankful and willing to talk. He explained that Dancing Hawk had allied with Lying Tiger (Weng Zheng) and that the inn the party left him and Dancing Hawk at was a black inn (one that serves human meat). He revealed that they had been attacked by the innkeeper and the cook (which is how Dancing Hawk lost his hand and eye) and that the Longevity Duck that Xue Lingsu had enjoyed was made with human flesh. He also told them that Lying Tiger had men all over searching for them (and that he was working with the Kushen now, including Princess Sarnai). They let River Master Li go and continued to the Red Mountain. There they saw three paths up the peaks and opted for the central one. They took a steep set of steps that passed by a 70 foot head of Hen-Shi carved into the stone. As they walked up the stairs they were intercepted by Lying Tiger and a group of Senior Mystic Sword Disciples (he had somehow learned or intuited they would be going this direction). Both sides faced off but were hindered by the narrow shape of the stairs. Min and Long Shu both used Great Stride to flank the Mystic Swords, with Long Shu behind them. They unleashed an effective series of attacks and the party quickly took down the entire group, killing Lying Tiger in the process. They continued to the Red Mountain, finding a vast chasm with a bridge leading to the villa. There they were accosted by a Monkey with a sword (Compassionate Monkey) who spoke and demanded they leave. He told them he had taken a vow to protect the bridge and that he could not allow them to pass. They tried to persuade him but this only made him angry. Eventually they managed to work out an agreement where they would trek back a mile or two and he would relay a message to the people in the villa that they simply wanted to discuss something important about the Phoenix Crown of Bao. This took some time but when they came back a man named Shuang was there with Compassionate Monkey and agreed to let them into the Villa so they could protect the crown. Inside the met with five brothers, all supposedly immortal (and each one larger in size than the next. They were cold but treated the PCs well. 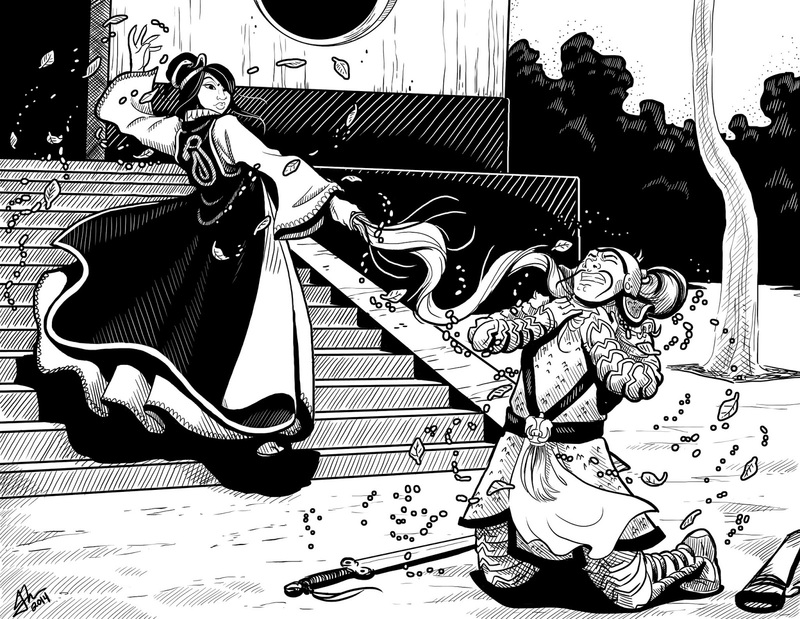 Shi Zhu gave them the crown on the condition that she could have it back when she needed it, and that Compassionate Monkey would let her (and only her) cross the bridge back to the villa. After the details were settled they set out for Je Valley to speak with the Master about the Merciless Sunflower Manual. Their trip there was uneventful and they were greeted warmly by the Valley Master, Gentle Demon. He promised to tell them what he knew if they agreed to serve as informants and help him influence the Martial World. They consented and he told them that he used to have the manual in something called The Je Valley Heart. Ten years ago he had married a woman from The Tree Dwelling Nun Sect and they were very much in love (this conflicted with Rong's understanding which was the woman, Huifing, had been kidnapped and forced to marry him). Six months ago he discovered that Huifing was a Fox Demon after they found several bodies with missing hearts in the valley. At first he tried to resolve the situation peacefully but the people demanded protection from the murders and he was forced to exile his wife from the valley (he couldn't bring himself to kill her). She was furious that he sided with the people of the valley and stole his Je Valley Heart, so she would take the box because he was heartless. Her intent was to go to the Heartless Bandits where she might fit in (because their initiation ceremony requires one to take out a victim's heart and present it to the leader). He didn't try to stop her at all. They exchanged news with Genlte Demon then left the valley. On their way to the Emerald Inn they were attacked by 24 Heartless Bandits, who they quickly defeated. Taking one prisoner they had him lead them to Heartless Fortress, the home of the Heartless Bandits. They learned that the master of the fortress had a new wife, and they assumed she must be Huifing. There they snuck into Huifing's chamber, where they found her sleeping. Kang Xi searched under the bed and found the Je Valley Heart.